Most of us hear that nuts are healthy for us and can help us lose weight, but there are also many seeds that can help you lose weight just as well as, if not better than nuts. Like nuts, seeds are a vital part of our diet and you should add to your diet. Most seeds are brimming with more fiber and minerals than nuts, while still having the healthy monounsaturated fats and protein that nuts are known for. 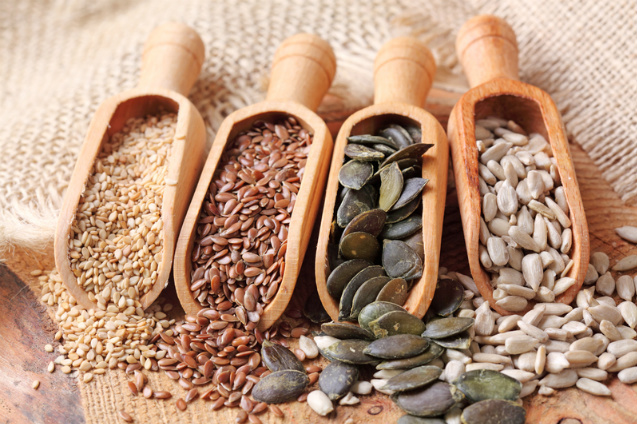 Healthy seeds are also great sources of protein, minerals, zinc, vitamin E and other life-enhancing nutrients, that can help keep our heart healthy and our body disease free. The protein, fiber, and health fats in seeds aid in satiety and help you feel full longer, so you may actually end up eating less during the day. Numerous studies have shown that different types of seeds and nuts can actually prevent weight gain, the development of heart disease and the accumulation of LDL cholesterol. Seeds such as pumpkin, sunflower and sesame contain around 150-180 calories per ounce, but are usually consumed in smaller quantities than nuts. There is only one way to derive nutrition from seeds and that is to eat them raw. Once they are exposed to heat, they produce toxic substances and the vitamin, mineral and essential oil profiles are denatured. For a healthy snack on the run, choose a small handful of these seeds throughout the day, and discover one of nature’s most powerful little weight loss secrets. These tiny seeds are loaded with vitamins and minerals, are an excellent source of fibre, protein and antioxidants, and are the richest plant source of omega-3 fatty acids. Consumption of chia seeds could help reduce joint pain, aid in weight loss, deliver an energy boost and protect against serious ailments such as diabetes and heart disease. Chia seeds help suppress the appetite, fire up the metabolism, and turn on glucagon, one of the body's fat-burning hormones. The trick is to soak them for 15 minutes so they swell up to 10 times their size. Just as with oatmeal, the larger the seeds are, the quicker your stomach will release those hormones that let you know you're full—and hopefully satisfied. Studies have shown that when used in conjunction with a healthy diet, chia seeds may help to lower cholesterol and blood pressure. These shiny, nutty-tasting seeds pack secret weight loss weapons: compounds called omega-3 fatty acid called alpha-linolenic acid---almost eight grams per tablespoon. Omega-3 is a good heart-healthy fat that has the reverse effects of saturated fats, which are known to contribute to obesity, cardiovascular diseases, stroke and other degenerative diseases. Flaxseeds contain vitamins, minerals, protein and its high fiber content (two tablespoons contain nearly five grams of fiber) can help to reduce cholesterol and regulate bowels. Flaxseeds also beneficial for weight loss because essential fats naturally satiate your appetite help increase your metabolism, and curb cravings. The omega-3 fatty acids in flaxseed oil can help make digestion more efficient, preventing insulin spikes that cause fat storage. Flaxseed oil is a common vegetarian alternative to fish oil, and those omega-3s are crucial to brain and tissue health. Hemp seeds are one of the super foods that are a great weight-loss helper. Hemp seeds have a double effect on weight loss. First, they contain almost 12 grams of protein in just 3 tbsp. and they contain omega 3 fats that help to burn fat in the body. This may be in part due to hemp seeds being high in omega-3 EFAs that omega-3s have been shown to have anti-obesity effects. Foods high in omega-3s, such as hemp seeds, have other benefits beyond weight loss through satiety. These same fats also prevent a low mood, which might have you turning to junk food later. Pumpkin seeds contain many essential vitamins and nutrients like potassium, magnesium, phosphorus and vitamin K; these may be beneficial for arthritis and help lower cholesterol. Pumpkin Seeds are great for your immune system with lots of antioxidants (carotenoids), omega-3 fatty acids and zinc. 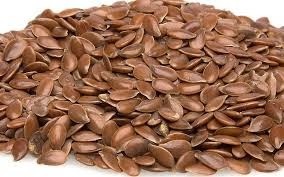 Pumpkin seeds have more zinc than any other seed, which is important for fat burning. Zinc helps the body produce the muscle forming and fat burning hormone testosterone. It also increases lean muscle mass and keeps your blood sugar steady. Stable blood sugar means weight loss if you’re trying to lose. They are also great for your digestive tract, and rich in protein to promote lean body mass and satiety. Pumpkin seeds can help you to lose weight if you eat the right amount directly after working out. Like other seeds, pumpkin seeds should be eaten in moderation since they're high in calories, and look for unsalted seeds to reduce sodium intake. 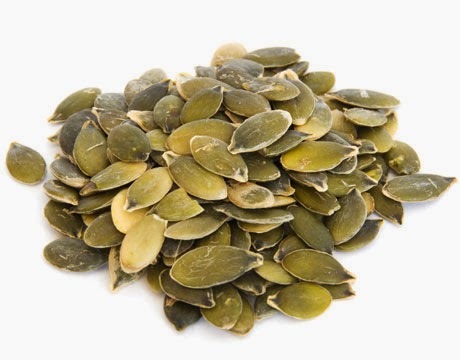 Pumpkin seeds may trigger migraines and IBS in people who are sensitive to nuts and seeds. Sesame oil which comes from the sesame seeds is a great source of healthy fats, as well as essential nutrients and minerals. If your goal is to lose weight, you can consume, both oil and sesame seeds, as both forms have benefits in weight loss diets. Sesame oil is a rich source of polyunsaturated fatty acids, including omega-3s, omega-6s, and omega-9s, all of which are crucial to weight loss, as well as maintaining cardiovascular health. Polyunsaturated fatty acids in sesame oil may play a role in the reduction of body fat. These polyunsaturated fatty acids increase the plasma levels of the hormone leptin, which is a hormone that regulates body weight. Leptin goes to the satiety center of the brain providing a full and satisfied feeling. In addition, these fatty acids serve as a steady source of energy for the body and improve satiety, preventing overeating. They also increase thermogenesis -- the rate your body burns fat, and elevate the metabolism. Sesame oil is a great source of healthy fats, as well as essential nutrients and minerals, but it is very calorically dense. Animal studies showed that plant chemicals, called lignans, in sesame seeds enhance fat burning by increasing liver enzymes that break down fat. Many studies found that protein and essential fatty acids increase the metabolic rate, and sesame seeds are loaded with both. 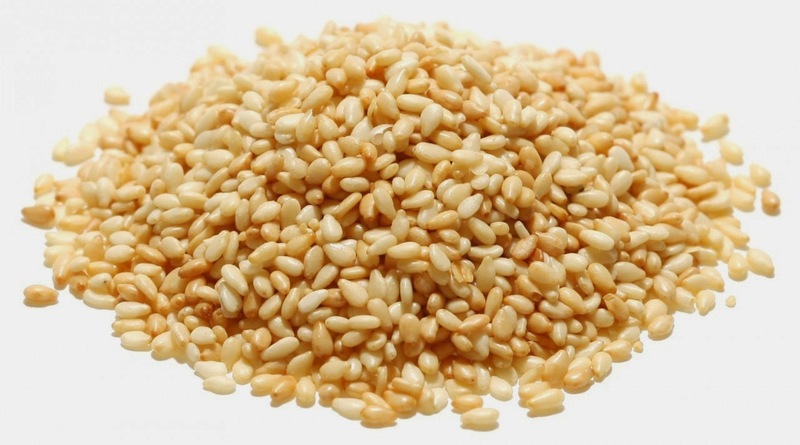 Like other seeds, sesame seeds may trigger migraines and IBS in people who are sensitive to nuts and seeds. Sunflower seeds are great for weight loss because the perfect phytochemical-rich seeds for those of us looking to lose weight. 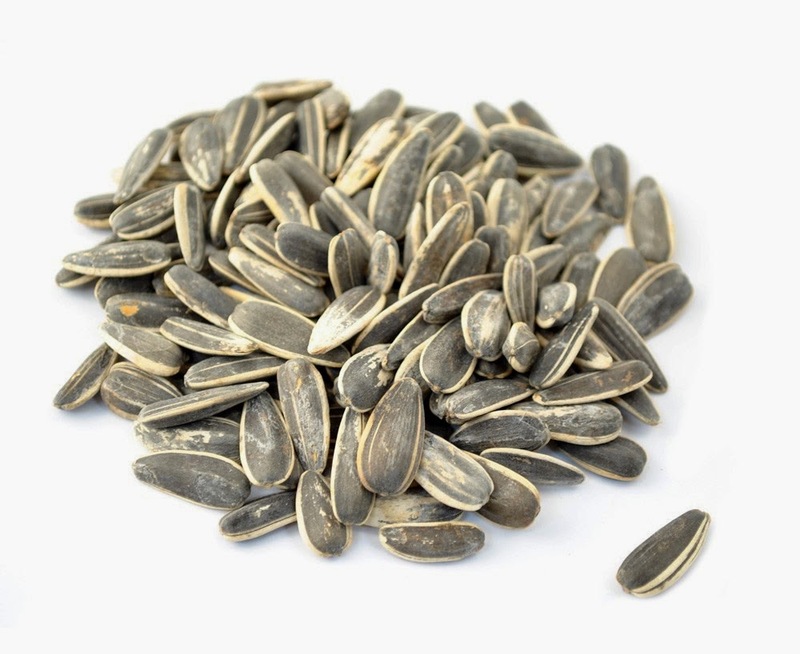 Sunflower seeds in the shell are a smart snack option for people who are trying to lose or manage their weight, since removing the shell on each seed will slow down your eating. Sunflower seeds contain a bountiful supply of dietary fiber, which could fill you up for longer and keep sweet cravings at bay, while easing digestion at the same time. Sunflower seeds are high in linoleic acid, fiber, magnesium and also help prevent heart disease and cancer with phytochemicals, folate, antioxidant Vitamin E, which acts as a powerful antioxidant to combat toxins and inflammation, selenium and copper. Sunflower seeds are also a rich source of magnesium. Magnesium helps keep your anxiety at bay and it prevents excess cortisol in the body. Magnesium also helps ensure a healthy nervous system and helps to energize you so you burn more calories. Sunflower seeds also contain protein and fiber, plus B vitamins, which are all very important for burning calories and keeping you full. Like other seeds, sunflower seeds may trigger migraines and IBS in people who are sensitive to nuts and seeds, so long as you eat them raw, not roasted.